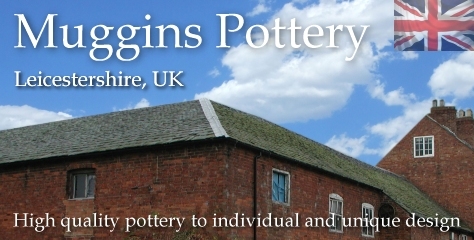 Money Boxes | hand-made pottery from Muggins Pottery in Leicestershire - wedding gifts, birthday presents, christening presents and anniversary gifts. Perfect for a unique Christening or birthday gift. Short names work well, eg DAD, TOBY, EMILY, JAMES, etc. Just order this unique name facility for each item purchased. Timescale - up to three weeks, usually less - if you have a deadline, just check with us in advance. Please remember that smaller items such as mugs don't have space for large names. Money box in the shape of a whale. Slot in the top for your coins and notes (can be made without a slot by request). It has a flat base to allow it to stand. No plug to remove your money, but this can be done with a simple piece of card. This item can also have bespoke letters added. One of Muggins' most popular items - a money box in the shape of a cat. Slot in the top for your coins and notes (can be made without a slot by request). No plug to remove your money, but this can be done with a simple piece of card. Tail can be pointing upwards or downwards - every one is unique. This item can also have bespoke letters added. Money box in the shape of a hound dog. A slot in the top takes your coins and notes (can be made without a slot by request). No plug to remove your money, but this can be done with a simple piece of card. Tail can be pointing upwards or downwards - every one is unique. This item can also have bespoke letters added. The classic Muggins Piggybank. There is a slot in the top for your coins and notes (can be made without a slot by request). No plug to remove your money, but this can be done with a simple piece of card. This item can also have bespoke letters added. The graceful Muggins HippoBox. A slot in the top takes your coins and notes (can be made without a slot by request). No plug to remove your money, but this can be done with a simple piece of card. This item can also have bespoke letters added. A Muggins money box shaped like an elephant with a large trunk. Slot in the top takes your coins and notes (can be made without a slot by request). Treat it well as it never forgets. No plug to remove your money, but this can be done with a simple piece of card. Trunk can point upwards, outwards, or downwards - your choice (check with us as to which we have in stock, or email us after placing an order - if we don't have it in stock, we'll make it for you in two to three weeks). This item can also have bespoke letters added at extra cost. One of Muggins' most popular items - a money box in the shape of a seated cat. Slot in the top for your coins and notes (can be made without a slot by request). No plug to remove your money, but this can be done with a simple piece of card. This item can also have bespoke letters added. One of Muggins' most popular items - a money box in the shape of a cat with a wild polkdot glaze. Entirely hand-made. Slot in the top for your coins and notes (can be made without a slot by request). No plug to remove your money, but this can be done with a simple piece of card. This item can also have bespoke letters added. Glaze colours - green gloss, oatmeal, light lilac, grey. The classic Muggins Piggybank. There is a slot in the top for your coins and notes (can be made without a slot by request). No plug to remove your money, but this can be done with a simple piece of card. This item can also have bespoke letters added. Finished in a lively polkadot glaze. The Muggins Hippo Money Box with some serious attitude - a very large item. A slot in the top takes your coins and notes (can be made without a slot by request); fill it and you'll be rich. No plug to remove your money, but this can be done with a simple piece of card. The photos show the giant hippo alongside one of our standard hippos. The giant hippo can also have bespoke letters added. Money box in the shape of a bull. Anatomically correct from the rear. The slot in the top is for your coins and notes (can be made without a slot by request). No plug to remove your money, but this can be done with a simple piece of card. This item can also have bespoke letters added. The Muggins Sheep Money Box. There is a slot in the top for your coins and notes (can be made without a slot by request). No plug to remove your money, but this can be done with a simple piece of card. This item can also have bespoke letters added. Buy several and create your own flock. so he can choose something else for his birthday! !